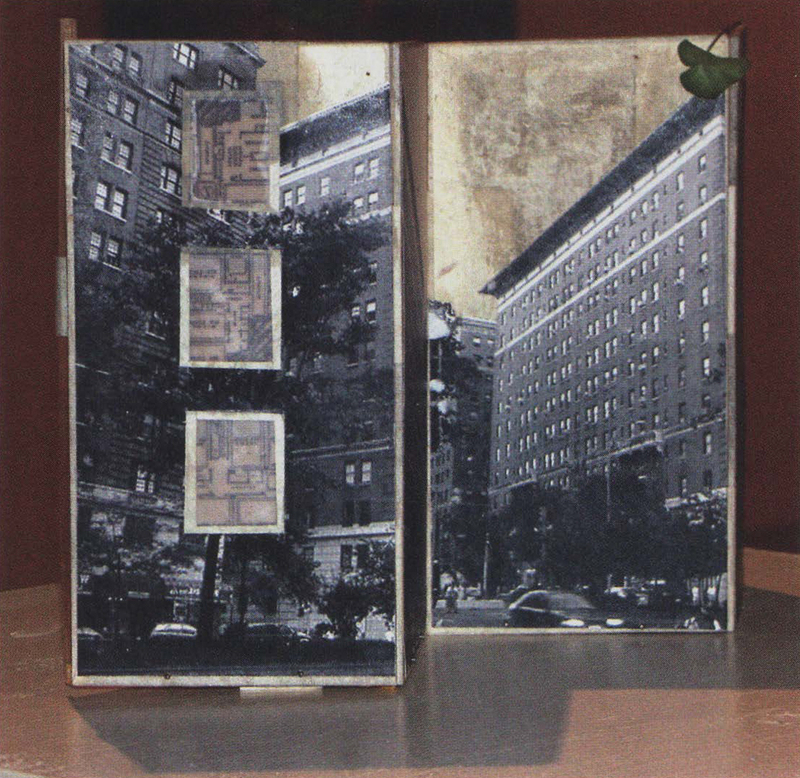 This work is an artist’s book/box. It is based upon a book form that I learned from Kumi Korf. The Japanese hinges are multi-directional (like piano hinges) so the book can open in different directions. The inside can become the outside, and the outside can become the inside. The book can also fold into a shrine-like container. I am interested in representing the integration of an intimate interior and a public exterior experience. E-mailing with Grace uses home and house as a metaphor for being: where each space represents a different aspect of memory and psyche. The exterior is an architectural structure, giving the appearance of solidity and containment. The interior space is intimate and poetic, including an enclosed garden, three windows or elevator shaft, floors and a walnut table containing small prints of actual email and a key, and a digital monoprint of my mother, Grace, watching over it all through a screen of mulberry paper. The book is also about the experience of thwarted communication in the spirit of “Alice in Wonderland.” In 1998, during the last few months of her life, my mother began to learn to use email. We sent email messages back and forth between New York and Skopje, Macedonia (where I was working on a 1998-1999 Fulbright grant), or we tried to at least. Both of us experienced some frustration in the effort. My mother struggled with learning an entirely new and alien form of letter writing, and my connections were often intermittent. We did manage to send our electronic letters back and forth, though sometimes they didn’t make it. One y ear after my mother passed away, I found email that she hadn’t been able to send to me on her hard drive. It was as if her voice came back through the ether. This work is for her. E -mailing with Grace is a cross-disciplinary project that combines book arts, collage, digital imagery, photography, and digital printmaking. The digital techniques include various image manipulations in Photoshop 7.0 and digital printmaking techniques. These printing techniques include digital monoprint transfers, solar etched plates using digitally created film, and straight-from-the-printer Canon color prints. All of the materials I’ve used have significance. They are as carefully considered as the placement of the various elements in the piece. Most of the paper is handmade. Some of it is mulberry and was specifically made for digital prints. Simon Semov gathered the fiber, and we made this paper together in Macedonia.